Lamont Cranston has a secret. He is actually the superhero known as the Shadow. 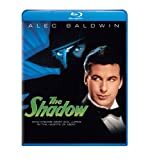 When he discovers that his longtime enemy Shiwan Khan has obtained an atom bomb, it is up to the Shadow to discover what Shiwan Khan plans to do with it. Reality starts to spiral when The Shadow realizes that the bomb will be used to take over the world. Utilizing his gift of invisibility, the Shadow begins his quest to put a stop to Shiwan Khan’s antics once and for all.